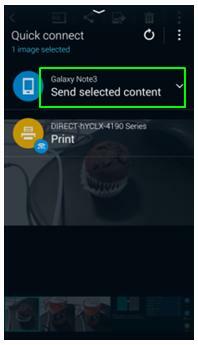 How do I share content with a nearby device using Quick Connect on my Samsung Galaxy S5? 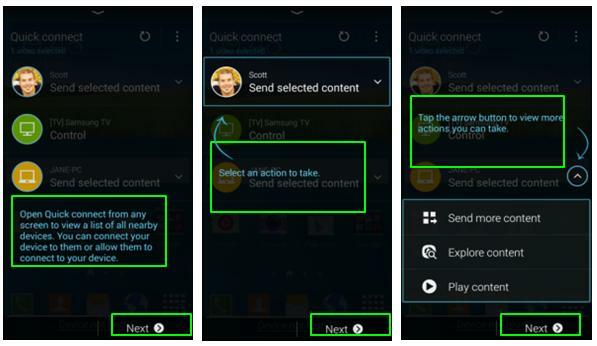 Once you have connected a nearby device to your Galaxy S5 you can conveniently share content stored on your device between nearby devices. 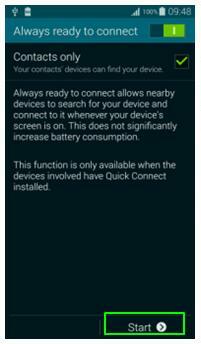 Note: ensure that the devices to be connected support Bluetooth and a Wi-Fi Direct connection and that the screens on both devices are turned on. 1. 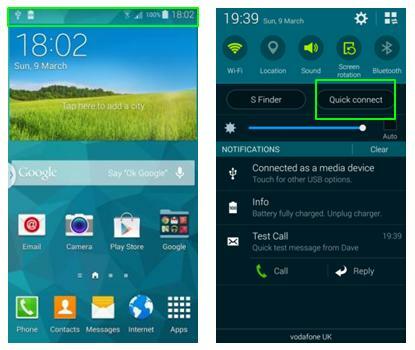 On the Galaxy S5 drag down the notification bar from the Home screen and then tap on Quick connect. 2. If this is the first time you're using Quick connect read the on-screen information and then tap Next to continue to the next screen. 3. On the Always ready to connect screen touch Start to begin using Quick connect. 5. Tap on the picture you wish to send then tap Done. The other device will begin receiving the file. 7. 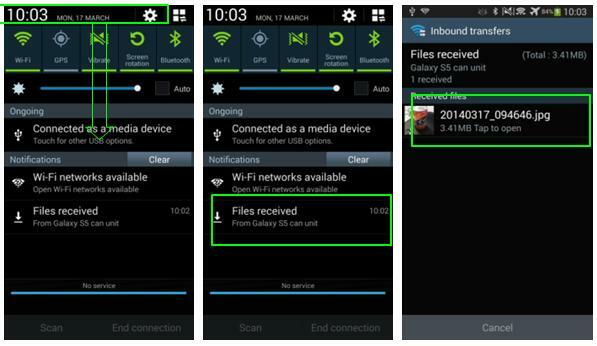 Drag down the notification bar at the top of the screen on the other device and then tap on Files received. You will now see the received file. 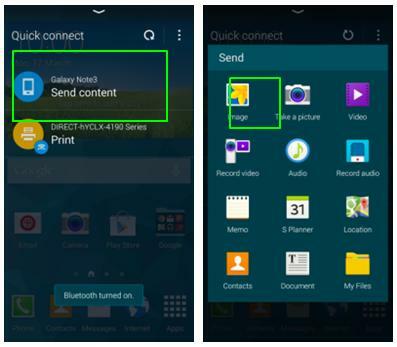 Once Quick connect has been set up between the Galaxy S5 and the Galaxy Note 3 you can use also Quick connect with ease while viewing a file on the Galaxy S5. 8. 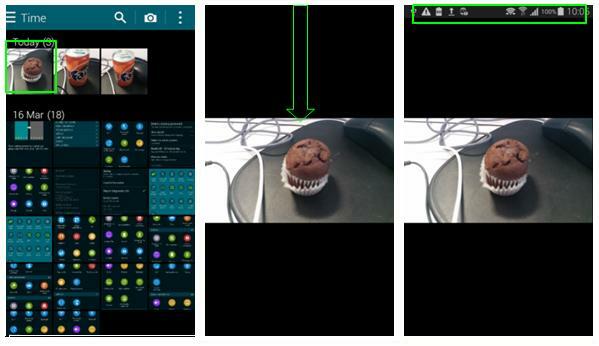 Tap on an image in the Gallery on the Galaxy S5 to view it. 9. Briefly sweep once at the top of the screen to reveal the notification bar. 10. 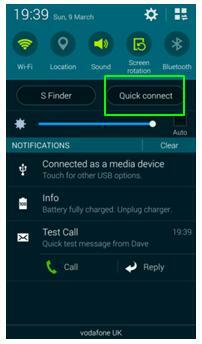 Drag down the notification bar and then tap on Quick connect. 11. 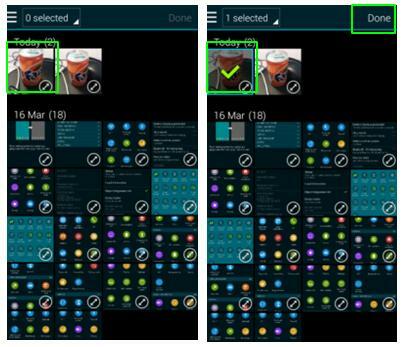 Locate the Galaxy Note 3 then tap on Send selected content. 12. 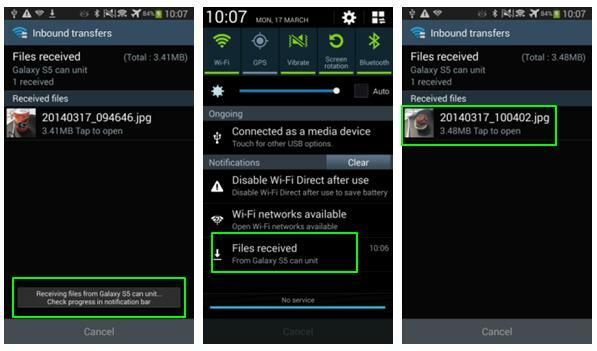 The Note 3 will begin receiving the file. 13. Tap on Files received. 14. You will now see the received file. Why is the wireless charging pad is slow and sometimes the device is not charged properly? 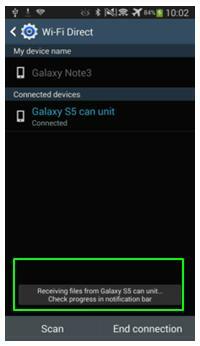 What is DLNA and how do I connect DLNA-enabled devices to my Samsung Galaxy S5?